Sharing my two cents. A blog primarily about issues revolving around the work/family balance, but also prone to life anecdotes and adoption musings. 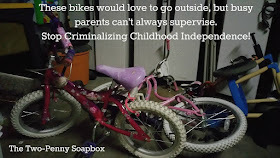 Piper: Mom, can I please, please go ride my bike outside, I really want to practice getting better on it. I will just ride it up and down the street. Me: Oh honey, I am not sure, I am leaving to pick up your sister from soccer practice in 10 minutes. Why don't you wait until Daddy gets home and see what he has going on. Piper: But, Mom....I really want to go ride my bike. I will be fine, just let me go out by myself. Me: I said no. Please wait. Your Dad will be home any minute. Piper: Daddy, Daddy, Daddy! I am so glad your home. I really want to go out front and ride my bike. Please, please, please. Dad: Oh honey, I would love to, but I have to get this email sent and dinner made, and then we need to get dishes and laundry done since we aren't going to have time tomorrow between work, homework and piano lessons. Piper: But, I can just go outside and ride. I will be fine. You don't have to sit and watch me. Dad: But, I do. Back when your Mom and I were little we could go ride our bikes all over the neighborhood, but now if I let you go by yourself someone might call the cops. Kids just aren't allowed to be unsupervised outside anymore and I really don't have time to just sit out there and watch you right now. Are any of the other kids on the street outside? Piper: [totally dejected] No. They hardly ever come out to play. Dad: Well, probably for the same reason. Kids just aren't allowed outside anymore honey, I am so sorry. I'll tell you what, I will let you have some extra video game time to make it up to you. Piper: Awesome! That works. Thanks Dad! Me: So, you totally just heard what happened there, right? Dad: Oh yeah. I heard it. I just told my 7 year old daughter I would prefer her to play video games inside instead of going outside for fresh air and exercise. But, was I wrong? Me: No. The last thing we need is CPS showing up on our doorstep because some "good Samaritan" assumes we must be negligent parents because we let our kids out of our sight. It just makes me so angry. I hate that just actually came out of our mouths. Dad: Well, maybe you should blog about it. We are failing our children. I have been talking about this for years; the frustration with our supervision obsession, our laser-focus on obtaining a zero percent mortality rate, our deep-seated need to control every single aspect of our children's lives so that their feelings are never hurt, they never experience unfairness, anger, difficulty etc. We are teaching our children to avoid risk and then lament the fact that America isn't really innovating anymore. We are building hot-house orchids in our country, not resilient risk-takers that are ready to tackle the future. This needs to end. I hate myself for having the above conversation with my daughter. I hate that this is only one of the many times I have made that same video game compromise so the kids wouldn't be tempted to sneak outside while I made dinner. SNEAK outside. That statement is ridiculous. 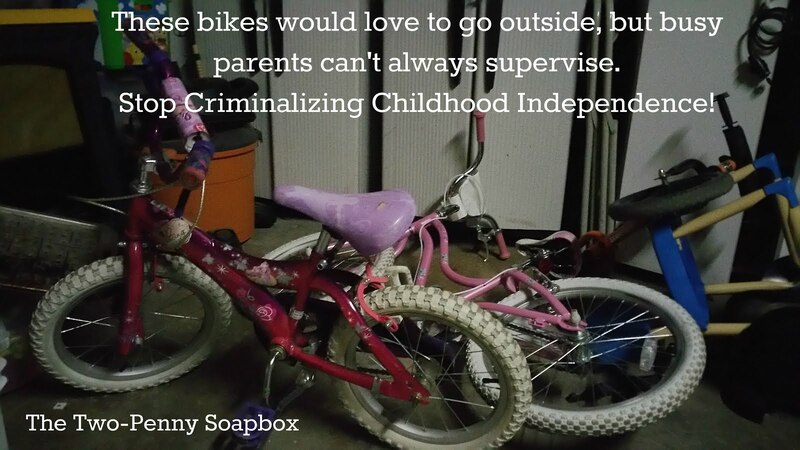 I hate that busy, time-crunched parents everywhere are choosing to lock their kids indoors in a misguided effort to protect them, but based on recent criminalization of childhood independence, I can hardly blame them. I too fear the "well-meaning reporter." I wish my kids knew the joy of running around the neighborhood with the other kids like we did. During the school year we raced home to finish homework so that we could turn ourselves loose in the neighborhood. We didn't come home until the street lamps turned on. When I was a kid we played Ghost in the Graveyard all summer long in the dark until someone's Mom came to kick us all back home. When we were kids we trusted our neighbors and that they would watch out for us and even *gasp* correct us when we were wrong. These days correcting another child is tantamount to a declaration of war. God forbid another adult approach little Maximillian on the playground and tell him that in fact, throwing gravel in other kids faces is generally considered uncool and it would be much appreciated if he would knock it the hell off. Doing that is almost guaranteed to bring a raging mother down on your unsuspecting head shouting about how people should mind their own business and she will parent her child however she sees fit without ignorant people interfering in her business (Um, I am pretty sure the rock in my child's eye is my business, but whatever). And here is the thing. I know there is another way. When I was living in the UK, one of the things I took notice of was that young children were almost never poorly behaved in public. Part of that was the fact that the Brits appeared to subscribe to the belief that children are not in fact welcome anywhere that adults are. People with children definitely took them out in public significantly less than Americans do. But, more importantly, correcting children was considered a community responsibility. Shopkeepers and neighbors would think nothing of shouting at an unruly teen or a misbehaved child. Here, we would see that as rudeness, but they see it as their responsibility. Molding the character of future generations is everyone's responsibility. It might not be a bad thing to go back to the days when the elderly neighbor would come out and yell at you for trampling her flowers or the store owner would ask a child to please stop screaming in his store. It shows the child that they are beholden to a whole community, not just their parents. Children need to learn that there are more authority figures they need to respect, not just family members. When someone corrects my child and I agree with them, I thank them. When they correct my child and I disagree with them, I stay silent and then I discuss it with my child later. I explain, in an age-appropriate way, why I imagine that person felt the way they did, and why I disagreed with them. As a preschool teacher, I have seen children who clearly are taught that the only person's opinion they need to value is their parents'. These children are extremely challenging in the classroom because they have little to no respect for other adults. This is challenging at 3 or 4, but down right dangerous at 13 or 14. We need to embrace community responsibility for our kids, even when we don't always agree with it. We need to teach them to respect adults and other authority figures in their lives. We need to start trusting our kids and their surrounding more and teach them to take risks. We can't just sit them in front of the television until they are 18 and then expect them to suddenly have the life skills to become successful adults. A parent who lets their child play unsupervised in the front yard while dinner is made should be celebrated, not denigrated. We need to stop prosecuting parents for letting their kids out of their sight even when....no....especially when they get hurt. When he was younger, The Husband broke his arm halfway into the two mile ride to school. At 13 he walked an entire mile home to get help. If that happened today, even to a 13 year old...the parents would be immediately forced to explain where they were and why they weren't supervising him. I really want to let my child play outside, but I don't have the time to sit out there and micromanage and supervise every second of her outdoor experience. I don't want to repeat the above conversation with my child. But, unless things change, I know I will - and I hate it. A concerned mother who sees a real need in the American culture for more defined support for all families, not just those with young children. I believe that by applying an anthropological framework to the issues facing parents and famliies today we can create a grassroots movement to improve the lives of millions of families. Let's forget "Family Values", and start Valuing Families. You can also come visit me over at ValuingFamilies.com, an online resource for working caregivers.